It’s not often a singer gets to make hit records under two different names, but that’s exactly what Jamie Horton did. In 1953, aged ten, and using her birth name Gayla Rienette Peevey, Gayla from Oklahoma City had a hit record with the novelty song “I Want A Hippopotamus For Christmas”. The Oklahoma City Zoo ran a Buy A Hippo For Gayla publicity campaign which raised enough money to buy a hippo which Gayla then presented to the zoo. 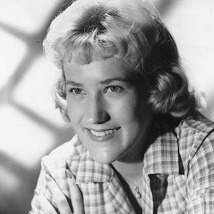 Aged sixteen Gayla was signed to Joy Records, but changed her stage name to Jamie Horton and immediately made Billboard’s Hot 100 with “My Little Marine” in 1960. Over the next few years she released nine singles working with arrangers like H. B. Barnum, Joe Sherman and Jack Nitzsche, one of the most popular being her version of “Robot Man”, which stole Connie Francis’s thunder in America.